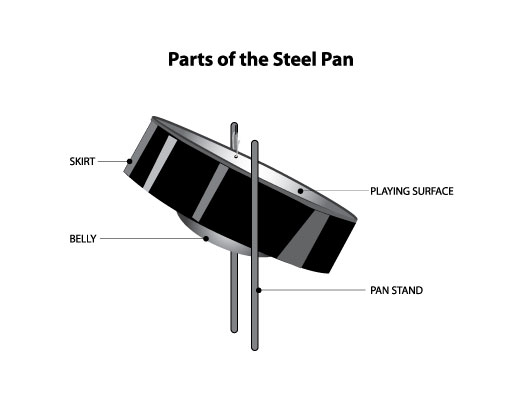 The skirt of a steel pan (steel drum) serves several acoustic functions. It helps to determine whether a pan will be low pitched or high pitched. 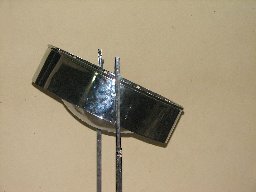 Therefore its length varies from pan to pan. 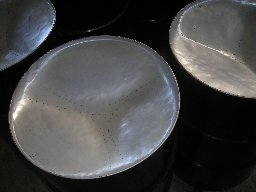 The lower pitched pans have longer skirts while the higher pitched pans have shorter skirts. Compare the skirt of the high pitched tenor pan to the skirts of the low pitched six bass pan. Compare the size of notes of the high pitched tenor pan to those of the low pitched six bass pan. The size of the notes also explains why some pans have multiple drums. For example, the notes of the six bass pans are huge! Only three notes can hold in each drum, but, if you want to play music in every key, you need twelve notes. 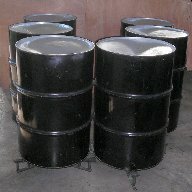 If three notes hold in a drum, you will need at least four drums to play in every key. 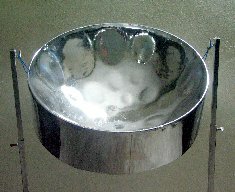 The six bass pan is actually made of six drums (hence the name six bass) each with three notes and all played by one person.